Contacted my excavator- he still says he can dig 31 holes for about $400. He came out to look at my site on March 3, and said he can dig the holes any time I want, but he did point out that I should have the plywood forms ready to drop in the holes the day he digs them. Which, at the time, I didn’t have any built, but I did have the plywood for them. Day 0: foundation is dug, forms are ready to put in ground, rebar is onsite, and cut to size. Day 1: level holes, install forms. Day 2: Orient forms perfectly so the rebar will be ready to accept logs. The whole focus is to ensure the line of rebar sticking out of the tops of the piers is within 1/16″ perfectly lined up along the center of each line of piers along each side of the house. This helps with attaching the dreaded first layer of logs to the foundation, which is a pain, from what I hear. Day 3: get pre-pour inspection done. Not sure what to expect here, but this is one of the inspections required by the city. I assume they are checking code to ensure piers are a minimum of 12″ below grade. Day 4: pour concrete and place rebar in the forms. Day 11:? pull plywood off forms. I think I wait a week after the pour to remove the plywood. I have to do this over a short time period (think: days), because I think my forms (due to winter water damage) probably can’t take any more moisture. I don’t want them sitting around in the rain in holes in the ground while my rebar is on order, or while I try to get them oriented correctly. I just want to get them in the ground, orient them, get them inspected, and pour the concrete- preferably over the span of 2-3 dry days. Fortunately, the internet is a fantastic place for letting someone else do the heavy lifting, and there’s a website that will calculate the volume if you provide the a,b, & h. Turns out I need 0.66 cubic yards for each of my smaller forms (28), and 1.28 cubic yards for the larger forms (3), for a total of about 23 yards of concrete (about $2300). I left the property after talking to Juni (the excavator) to go home and build forms. I built them all afternoon, and most of the next day (Saturday). Then I spent all week (when it wasn’t raining) building more. I almost finished building all 31 after a week of work. I need to put together the last three (which are the big ones- 54″x54″ base, 45 1/4″ tall). My plywood was covered by a tarp all winter, but it still soaked up some water, which worries me. Concrete weighs about 3,700 pounds per cubic yard, and each pier is about 0.66 cubic yards, so I can figure about 2,400 pounds per pier. So the forms have to withstand 65 pounds per square foot (at least at the top). I also have to worry about the corners of the forms blowing out, or the bottoms, or maybe the whole pier will lift when the concrete is poured. I plan on using the extra dirt from the excavation to hold the forms down during the pour, and I’m adding collars to each one- found a cheap place (Mike’s Merchandise) to buy bolts – they sell surplus bolts and nuts for $1.00 per pound (13 nuts and bolts were a pound). 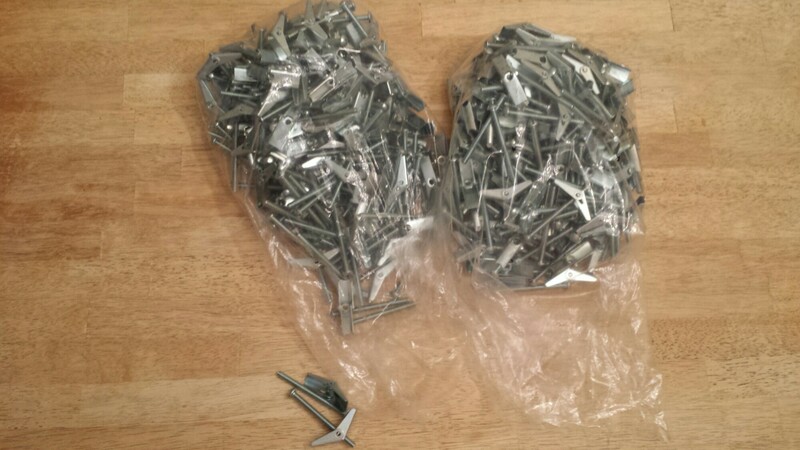 I bought all they had in one size and ended up at about $20 of bolts- enough to do about 70% of the collars. If I had bought the same bolts at HomeDepot, it would have cost me $1.00 per bolt/nut, meaning, I would have paid about $372.00. So, my deal of $20-$30 is pretty cheap. Pays to shop around. After building the forms, I have this huge pile of scrap leftover that I plan on using as part of the collars to strengthen the forms. This has to be done before I can pass inspection- must have running water on site before you can pour concrete. I went in January to get the utilities installed, but the utility company said I had to have a building permit. I went to the city to get the building permit, and they said I had to have utilities installed. Arggh! Will someone just please take my money so I can build? I went back today, after getting the building permit- and they said, “Oh, do you have a copy of your building permit?” Well…..yes….posted out there on the property, like the city requires…. No matter- have to wait for the city electrical engineer to go out now (something else they didn’t mention last time….) and decide whether there’s enough power in the area to drop a line onto my property. She said she’ll take a picture of the permit while she’s out there tomorrow. And I got the quote, too: normally, they come out and install a temporary utility pole with the meter on it. When you’re done building, you move the meter onto your house, and they come get the temporary pole. Of course, my build can’t be that simple, no- there’s no poles near my property – they are all across the street. So I have to pay for a permanent pole, plus a temporary pole (not sure why they can’t be the same). I also have to pay for a transformer. Expected cost: $5,000 for water, $385 for the temporary pole, and $1800 for the permanent drop. Things are adding up…..
HomeDepot (hate to pick on them because they actually do sell 2×4’s for a good price, and they do have a lot of stuff in stock when you need it) sells rebar for about $0.50 per foot. I did the math- 7,000 ft for $1,000 works out to $0.14 per foot- a screaming deal. Except the guy (or gal, I guess), didn’t leave a phone number. Of course, 7,000 feet of rebar weighs 7,000 x .668 = 4676 lbs, so I’d need a bigger trailer (I think mine is rated for 2,000 pounds). But I only need 2600 feet for the cabin, and maybe half that for the garage. In the end, I could probably sell the scrap, and make my money back. In the end, the guy didn’t post any contact info- I pressed the “let poster know they didn’t leave any contact info” button. Several times. And again yesterday. And today. Twice. Maybe three times. So I looked again for other ads, and found this guy in Decatur that says he’ll beat any price. I called him, and he did- $0.29 per foot. And he’ll cut it for free. The old “a bird in the hand is better than two in the bush” holds true. And he spent all week last week cutting out plywood for forms for a house he’s building for himself. He wants the rain to go away, too…..
All of this adds up, of course, to a lot of money, time, and exhaustion. The main thing I’m worried about is that my forms don’t get left in the rain for days while I wait for an inspection, or the concrete, or the excavation. Getting all the materials, inspections, installations, and people lined up is quite an adventure. But once the foundation is done, the next adventure begins: getting ready to stack logs.